Filorga Age-peel skin new restructuring program. 20ml+ 5s. 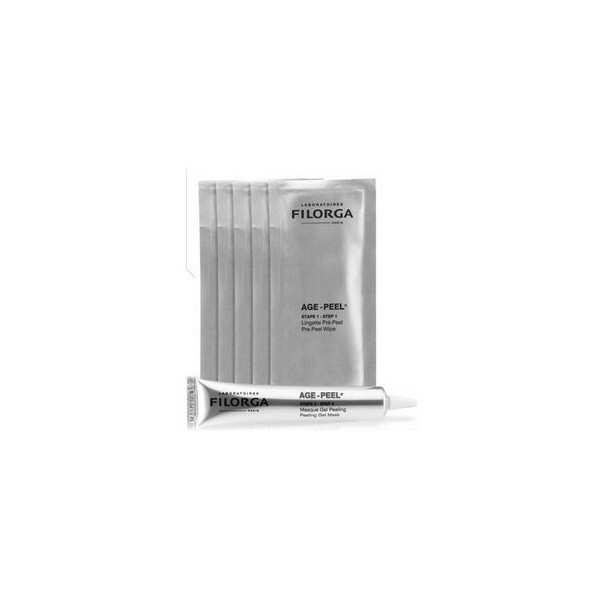 Filorga Age-peel skin 20ml new restructuring program. + 5s. 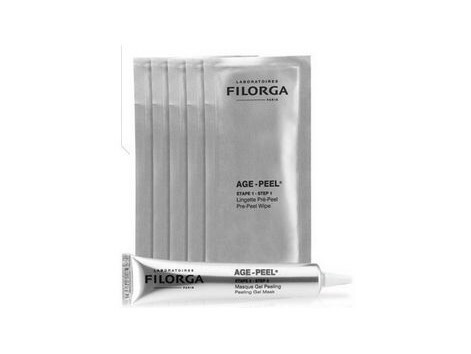 Age-peel with Filorga offers 5 sessions to recover a visibly smoother and more even complexion. Ideal also as a complement to medical scrubs. 1. Preparation: prepeeling solution enzyme papain. 2. peeling gel mask 6 hydroxyacids to smooth wrinkles, smoothing skin texture and erase imperfections and stains. How to apply Filorga Age-peel? The pretreatment enzyme papain: gently peel start. With a clean face and make-up removal, using a washcloth pretreatment to evenly distribute the solution over his face. The skin will be ready to apply gel mask peeling effect. Gel Masque peeling effect: cocktail hydroxy acids (glycolic, lactic, malic, pyruvic, salicylic and azelaic) ensures effective and progressive action in absolute safety. Apply a generous amount of gel mask peeling effect avoiding the eye area. Leave on for 2-6 minutes. A tingling sensation, a sign that the mask is acting feel. Then remove the mask using water and cotton pads. If redness or tingling should experience is too intense, rinse immediately. It is recommended NEOCICA®, universal restorative cream after treatment AGE-PEEL®para soothe the skin and optimize skin regeneration.